Ore Athletic Football Club has withdrawn from the East Sussex Football League Premier Division shortly before the start of the new season. The club cited a lack of committed players as the primary reason for its withdrawal, but hopes to regroup over the coming months and get back in action in a year’s time. Athletic have finished second-bottom and third-bottom in the previous two seasons, after years of sustained success, but the club insists its withdrawal isn’t because the going has got tough. Dave Cornelius, who helped form the club with Southon but whose involvement has lessened in recent times amid the joint problems he’s currently battling, said: “It’s absolutely sad news for the club. I agree with Mick’s comments. “The commitment in the last couple of seasons from what I can gather hasn’t been up to the level Mick expects it to be. Thanks to Biggs’ generous sponsorship, Athletic had paid their relevant affiliation fees for the coming season (money which they will not get back) and the club has also upgraded its kit, which bears the sponsor’s name. Ore Athletic was founded in 2006 and began life in the old Hastings & East Sussex Sunday Football League, finishing runners-up in Division Two during its first season. Athletic came second in Division One for the following two campaigns and won the title in 2010/11. The club won the Peter Harris Memorial Trophy in 2007/08 and Demarco Cup the following year. Athletic switched to Saturday football in 2011 and enjoyed a remarkable first season, winning Division Two and the Wisdens Sports Challenge Cup, as well as becoming the first side from Hastings to win the Sussex Junior Challenge Cup since 1923. The club finished runners-up in Division One during the 2012/13 campaign and has played in the Premier Division since, finishing third in 2014/15. Cornelius maintains the foundations are there for the club to rise again and says it will assess its options over the coming season in the hope of returning to the field next year. 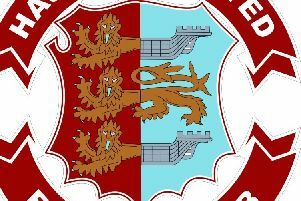 Athletic’s withdrawal means the Premier Division, which had already lost reigning champions Hollington United to the Mid Sussex League, is down to 10 teams for the coming season. There will again be six divisions in 2018/19, although the number of competing teams has dropped from 61 at the end of last season to 56. There will be nine sides in Division One, and 10 in Division Two, Three and Four and seven in Division Five. The action will kick-off on Saturday September 1. East Sussex League Premier Division line-up 2018/19: Battle Baptists, Bexhill AAC, Bexhill Town, Hawkhurst United, Northiam 75, Robertsbridge United, Rye Town, Sedlescombe Rangers, Sidley United, St Leonards Social.